A few weeks back Raley's started doing a makeover on their store isles. Mostly rearranging and bringing new products in. Besides an Indian section (with some vegan jarred curries) the natural foods department got some new treats. 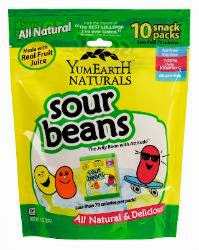 I was looking at the candy section which is right next to the energy bar section now and came across Yum Earth Naturals' Sour Beans. I was skeptical at first - finding vegan jelly beans is no easy task, however they wre vegan so in the cart they went! They come in individual snack size portions - which I like! They are sour put not horribly so, they are sweet and the flavors play off each other nicely. Since my first pack I have bought more. I was always sad when Easter came around and I could not find vegan jelly beans but now I have these and I am happy! Are you a fan of sour candy?